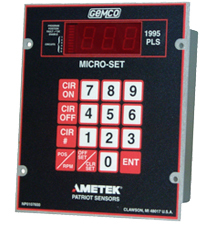 The Gemco 1995B Series Micro-Set Programmable Limit Switch (PLS) with Brake Monitor is designed for use in the mechanical press industry. It incorporates many features for safe, efficient press automation. This completely self-contained PLS can turn up to 30 independent mechanical relay outputs on or off based on the rotary position of the press crank. On-line brake monitoring checks the stopping time of the press against a customer-selected preset stopping time. The 1995B Series PLS can also be used to check the stopping distance at any point in the stroke. A dedicated mechanical SPDT relay remains energized when stopping time is within tolerance. Once exceeded, the mechanical relay de-energizes to initiate a stoppage or warning signal. This Programmable Limit Switch can be used with our Series 1986 Resolver Assembly.